Continuously from 2000 until now, Vovinam Vietnam Traditional Martial Arts and international friends are welcome through referral, overseas promotion events including the World Martial Arts Festival in Chungju, South Korea an important event will join this outstanding event with martial arts 44 of 40 countries in the world. This year, Vietnam sent a pretty powerful group includes union leaders sport sector of Ho Chi Minh City, including Mr. Le Ton Thanh – Deputy Director of the Department of Culture, Sports and Tourism City Minh, Truong Ngoc To – deputy director of the Sports Centre in Ho Chi Minh City to attend meetings of the Board World Martial Arts Association to organize the project presentation International Martial Arts Festival 2015 in City Ho Chi Minh City as proposed by President Byong WoMAU Soh Young and Vice Chairman of the municipal People’s Committee Hua Ngoc Thuan, Ho Chi Minh in 2015 the first meeting between Ho Chi Minh City and WoMAU well as study tours organizational experience of the organizers Festival Chungju. Vovinam was chosen as the symbol of the park entrances World Martial Arts. Vovinam this year by Nguyen Phu Yen – Deputy Director of the Department of Culture, Sports and Tourism in Binh Duong province with the participation led by coach Nguyen Tu and 6 athletes contents of Binh Duong authorities had achieving excellence in South-Eastern League in Vung Tau last as Ho Thanh Liem, Cao Man Dat, Nguyen Van Vinh, Nguyen Hoang Huy Phong, Nguyen Van Phuc, Nguyen Thu Thao. 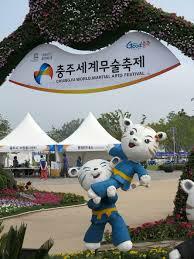 According to Vo Danh Hai – Vice President WoMAU, Secretary General of the World Vovinam Federation, this year’s Festival has many important activities: Programme Festival will be held under the support extravaganza, sponsored professionals from the Experts from UNESCO and the Ministry of Culture, Sports and Tourism of Korea. These boxers come from 40 countries around the world will also contest the official representation of the Organizing Committee with three important awards: Award Minister of Culture, Sports and Tourism of Korea given file content can, League Governor Chungcheongbuk-do but practice given content and solutions and Mayor Chungju World Martial Arts Association awarded to the runners in this competition. At the meeting of the Council held on 27 WoMAU and August 28, 2014, the Executive Board will be more adjusted to the charter, regulations operate to enhance the strength of the international organizations in conservation and development of the martial arts world. Vietnam boxers won a Silver Award at the World Martial Arts Festival 2012. The delegation will head to South Korea from August 25 to August 31, 2015.